Enjoy this sweet and savory mix of Planters Nuts and Chocolate Trail Mix. Made with a decadent mix of M&M's milk chocolate, almonds, peanuts and raisins, this healthy snack is one the whole family will enjoy. 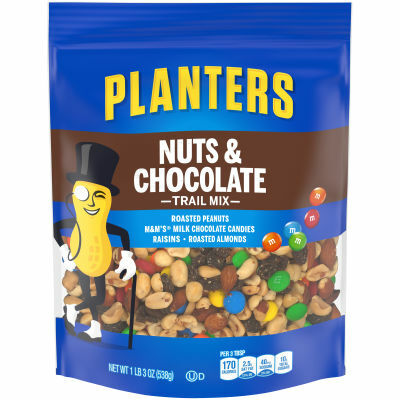 - Planters Nuts & Chocolate Trail Mix is conveniently packaged in a resealable 19 oz. bag so you can enjoy this tasty treat while you’re on-the-go.